Daniel Specializes in Salmon fishing. He often tells me that every time he catches a King Salmon he pulls a hair out of his head. Well, if you haven’t noticed lately he hasn’t got a lot left up there. I think he’s just bragging. 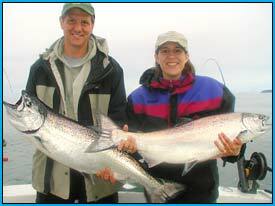 King (Chinook) Salmon fishing is fantastic year round. There is Feeder King Salmon here twelve months of the year. They come up from the West Coast to feed before returning to the rivers of Canada, Washington, Oregon and Alaska to spawn. These king salmon average 15 to 20 lbs. and may get as large as 60+ lbs (62 lbs being Daniel's largest). There are two runs of King Salmon returning to the Kenai Peninsula to spawn. The first run is headed towards several river systems such as the Anchor River, Kasilof River, Deep Creek, Ninilchik, and Kenai River or enhanced systems such as Seldovia, Halibut Cove, or the Homer Spit Lagoon. They start to trickle in around the first of May and peak around the middle of June. 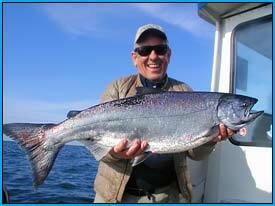 King salmon from this run may be caught as late as the end of June. These salmon average 15- 25 lbs. and may get as large as 60 lbs. The second run of King Salmon to the Kenai Peninsula is headed towards the Kenai and Kasilof Rivers. They start around the last week in June and run until the middle of July. These salmon are the largest, averaging 25-40 lbs. and may get as large as 90 lbs. 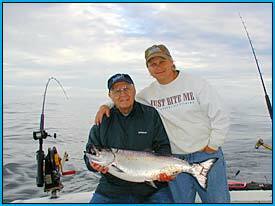 The King Salmon fishing limit is 1 or 2, per person, per day depending on what zone you fish. 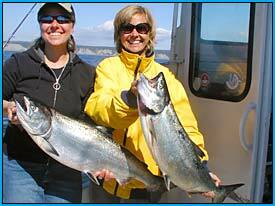 You may catch a total of 5 King Salmon between April 1 and October 1. From Oct. 1- April 1, the 5 fish total limit is waived, although the 1-2 fish daily limit is still in effect. 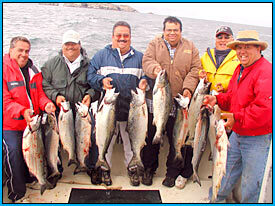 Silver (Coho) Salmon: The Silver Salmon run starts the middle of July and may run until Mid-September with the peak being around the 10th - 25th of August give or take a week. Silvers are 6-8 lbs. on the average and may reach the 30lb. range. 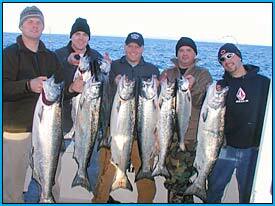 The fishing limit for Silvers is 3 fish per person per day. 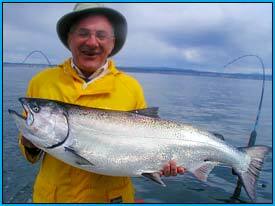 Other Salmon: Other Salmon species that may be caught are Red (Sockeye) Salmon, Pink (Humpie) Salmon, or Dog (Chum) Salmon. All Salmon run times may vary depending on when the fish decide to show up.